The '33' sign on Royal Street. Photo credit http://disneyparks.disney.go.com/blog. It is Disneyland's most exclusive and expensive restaurant. Yet many people walk right by the inconspicuous entrance without realizing what's behind it. Discreetly located between the Pirates of the Caribbean exit and The Blue Bayou restaurant, on Royal Street in New Orleans Square, Club 33 is a posh, member's-only eatery. (To spot it, look for the teal door with the crystal address plate engraved with the number 33.) Walt Disney designed this private hideaway to be an elegant VIP lounge for his corporate sponsors—a place with impeccable service and 5-star food and wines. (It's the only place in the park that sells alcohol.) Companies like Kodak, Goodyear and General Electric—sponsors of the park's early attractions—were among those on the guest list when Club 33 opened in May 1967. Later on, additional corporations, and select individuals, were allowed to join too. Unfortunately, Walt died 5 months before Club 33 officially opened. But the restaurant lives on and has gained a cult-like following among Disney die-hards. Members pay around $10,000 or more (plus annual dues) simply for the privilege of reserving a table here. The cost of the meal is extra. The waiting list for prospective members is said to be something like 15 years long, and new applications are no longer being accepted. Disney doesn't even publicize Club 33 because it's so hard to get into. But if you're lucky enough to know or work for a member, you can attend as their guest. Thanks to a friend who made a reservation on her behalf, Joice Truban Curry, of San Diego, recently took her family to Club 33 for her sister's 25th wedding anniversary. The lunch bill ran around $80 to $100 per person, but the food, service and unique experience were well worth it, she says. "We felt like rock stars." 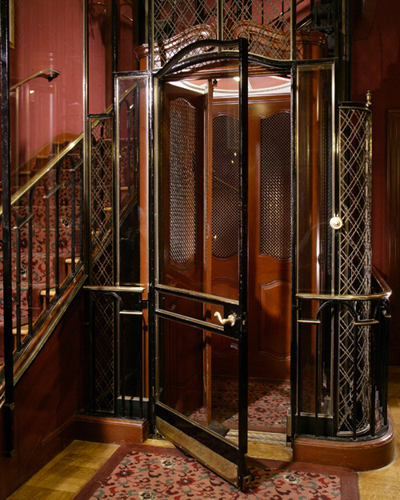 The Victorian-age, French-style lift that takes guests to the second floor is a reproduction of one that Walt admired during a trip to Europe. Photo credit http://disneyparks.disney.go.com/blog. 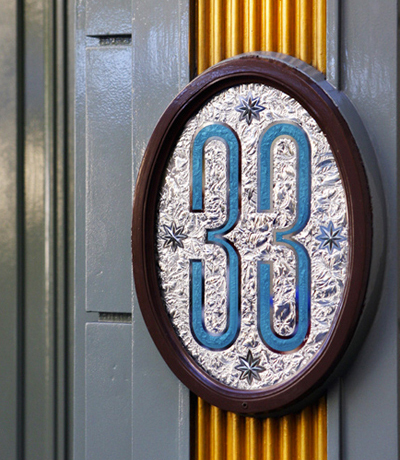 What's so special about Club 33 beyond it's oh-so-selective cachet and hefty price tag? Walt and his wife Lillian hand selected much of the décor, traveling to Paris and New Orleans for inspiration. With the help of movie set designer Emile Kuri, who worked on Mary Poppins and 20,000 Leagues Under the Sea, Walt's vision of an intimate French-style, antique-filled salon was brought to life. Rare Disney artifacts and original concept artwork by Imagineers abound, as do Walt's playful touches. And in typical Disney-magic fashion, the experience begins at the front door. To enter, guests press the intercom, announce their name and reservation, and get buzzed in to the Foyer. From there, a grand old French Lift—patterned after a hotel elevator Walt rode in Paris—takes them upstairs to the Gallery, which has a table from Mary Poppins and a telephone booth used in The Happiest Millionaire. Lounge Alley leads past an antique harpsichord (it's said that Elton John and Paul McCartney both played it when visiting) and on to the two dining rooms. 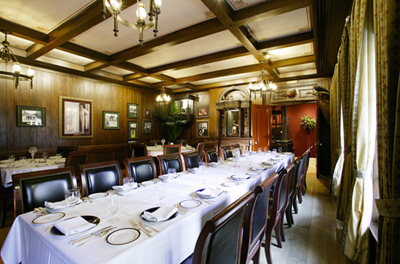 The Main Dining Room is formal, decorated with 19th-century French furnishings. The wood-paneled Trophy Room is a tad more casual, and has a fascinating history. Walt originally intended this room to have a dinner show starring Audio-Animatronics animals that would interact with the guests. Microphones were planted in the chandeliers, so that the creatures could hear and join in on diners' conversations. Though the concept was abandoned before it premiered, due to privacy issues, an Audio-Animatronics vulture is still perched in the corner, and the disconnected mikes can be spotted in the chandeliers. 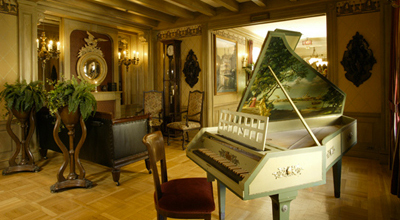 This hand-painted harpsichord in Lounge Alley was a result of a shopping trip to New Orleans. Photo credit http://disneyparks.disney.go.com/blog. Another cool feature of the restaurant: The balconies. "You can go out there and look at everyone passing through the park," says Truban Curry. "They're so busy racing to the next ride, they don't even realize you're up there having this incredible experience." And of course, there's the 5-star food. "It was pretty amazing," says Ben Wong, of Hayward, Calif., whose friend got a small group in for lunch. After ordering their main courses (choices included salmon, free-range chicken, and chateau Briand, all beautifully presented), they helped themselves to lobster, crab, shrimp and other appetizers from the cold buffet. "The desserts were uncanny," Wong adds. There were s'mores martinis and other "goodies you normally don't see." The Trophy Room, which was originally going to feature five Audio-Animatronics figures; the show never developed, but you can still see the vulture perched in one corner. Photo credit http://disneyparks.disney.go.com/blog. So how do you snag yourself an invitation to this extraordinary place? Ask around. Spread the word via Facebook and Twitter. You never know when a friend, or an acquaintance of one, is a member. That's how Nathan Casper, of Las Vegas, was able to take his wife there for her birthday. "She's a Disney fanatic, and I'm a relentless schmoozer and got us on the guest list through a friend of a friend," he says. Since "most of the memberships are held by corporations, see if your employer has access, or if anyone you know works for a company that might have a membership," suggests Carrie Hayward, who runs DisneyTravelBabble.com and is the author of PassPorter's Disney Weddings & Honeymoons. "I would imagine that many of the same companies that sponsor Disneyland attractions would be contenders," she says. Also build relationships in Disney online communities and fan sites, like MousePlanet.com, MiceChat.com and Disboards.com. "As you make friends in these spheres, you may find the degrees of separation between you and Club 33 decrease," says Hayward. An archived MousePlanet.com article from 2001 featured a Club 33 member who made a reservation for a guy who wanted to propose to his girlfriend on the restaurant's balcony. Also keep your eyes open at charity auctions. Sometimes members donate Club 33 reservations (after getting Disney's permission) to benefit a good cause. When Ann Rommel, of Monarch Beach, Calif., saw a brunch for 4 being auctioned off at an Orange County benefit, she set her sights on the prize. "I kept a watchful eye on the bidding all night long, and when the bells rang, I was the lucky winner," she says. If all else fails, and you feel as if you must sneak a peek, try Disneyland's Walk in Walt's Footsteps tour. You won't get to eat there, but you will feel like a VIP as you glimpse the restaurant's elegant Foyer and that beautiful French lift commissioned by Walt himself. For more Disney hidden gems, check out our list of Disney's best off-the-beaten-path thrills!